Driving across town I was stopped when the railroad crossing lights flashed and the red and white bars lowered to halt traffic. It was a sunny spring day and I didn’t mind being caught on the waiting side of the track. I watched with child-like anticipation for the approaching train. For me trains bring a sense of nostalgia, a reminiscent feeling of yesteryear. I found myself feeling grateful for this moment as the black steel engine rolled noisily into view, followed by a succession of box cars. I noticed how slowly it passed and thought how easy it would be to jump. Instantaneously, I found myself half a world away on a cold January day in Akkol, Kazakhstan. That was the day I had run through the snow, thrown my suitcase onto a moving passenger train, and leapt on. Jumping a train makes for a lasting memory. Even more so because my newly adopted children were already sitting onboard. The train had been late and, unable to wait any longer, I ran back into the station for the bathroom. Granted I was jet lagged, but It seemed only a moment that I was gone. Yet in that moment the train rolled in, picked up the few waiting passengers, and blew its whistle. When I returned, it was already rolling down the track. Standing at the only open door, my translator waved desperately and yelled for me to run. Run, I did! I saw the eager faces of my six-year-old twin sons staring out the window as I ran alongside the track with my luggage. It was their first time on a train and they were too deliriously excited to understand that my missing it would not have reflected well on their new mom. Instead, they laughed joyfully and yelled for me to run in their sweet Russian-speaking voices. Just ahead my translator reached for my suitcase with one hand while holding onto the train with the other. I flung it past her effortlessly, grabbed the metal bar next to the step, and hoisted myself into her open arms. From inside the passenger car I heard cheers and applause. I will never forget how I felt in that moment; surreal as if acting a scene from a movie. It was my first and last train hopping and no-doubt one of my most exciting adventures. My twin sons no longer remember the day they left their orphanage. They’ve long forgotten the train ride back to Astana where they played in the ice village in the evening after dinner. Nor do they recall flying to Almaty to visit the American Consulate, or flying to Moscow to finalize paperwork through the American Embassy before the long journey home. What they do remember was walking into our North Carolina home for the first time. There they discovered two big dogs excited to meet them and screamed in fear. Their first memory of coming home was the fear that my beastly dogs would eat them. Memories are amazingly powerful. They are easily triggered by music, smells, and in this case the slow passing of a train. I was so deeply transported to another place and time that the car behind me honked when the gates reopened. By the time I’d found my way back to the present moment, I had jumped the Akkol train several times to the cheers of my young sons. I love reliving cherished memories that make my heart sing. Memories of being a super-shero are even better. 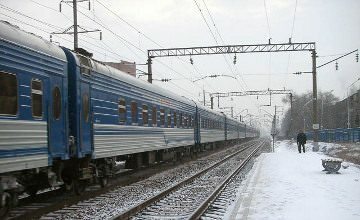 I’ll never forget racing through the snow, throwing my suitcase onboard as if it were a shoebox, and hopping the train. Isn’t life one grand adventure? 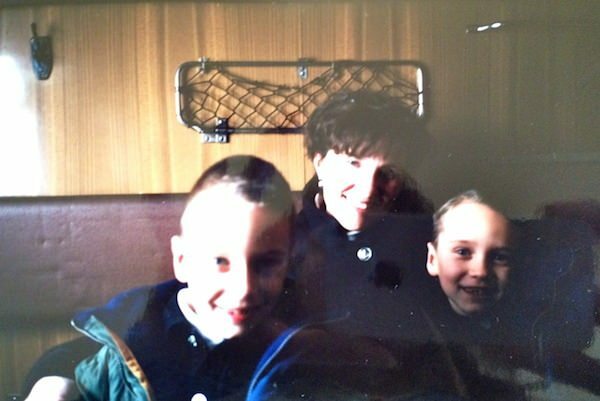 My newly adopted twin sons Alex (l) and Sergei waiting with the translator at the Akkol train station, Jan. 2001. After jumping the train, I celebrated with Sergei (l) and Alex. 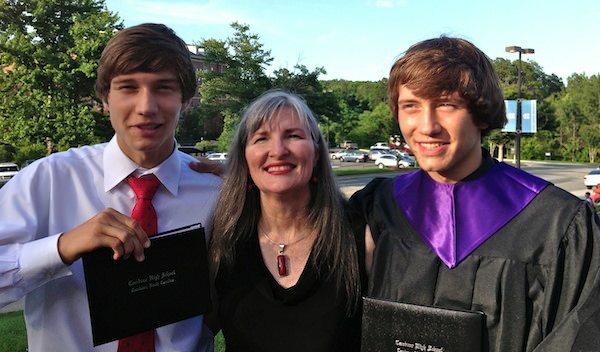 Twelve years later with Sergei (l) and Alex at their high school graduation.